Student collaboration fosters peer learning, part of the course objectives. The sparkling red brick and glass buildings in the Virginia Tech – Carilion corridor continue to bring Roanoke more than beautiful structures that often show reflections of the surrounding mountainous landscape. The cutting edge facilities downtown evidence the synergistic VT – Carilion relationship that is likely proving to be even more beneficial and powerful than those who first conceived of a partnership more than a decade ago. While the medical school is often top-of-mind, the biomedical research facilities and attendant on-site degree programs contribute to bringing advancements that will impact how medicine, biotech and healthcare are done. VTs Pamplin College of Business and its Apex Center for Entrepreneurs is increasingly a catalyst for bringing medical and health research ideas to market. By planting entrepreneurial seeds in the minds of present and future researchers in the program, the Roanoke campus helps make that possible. Lauren Bochicchio with (L-R) Mark Van Dyke, associate professor, Dept. 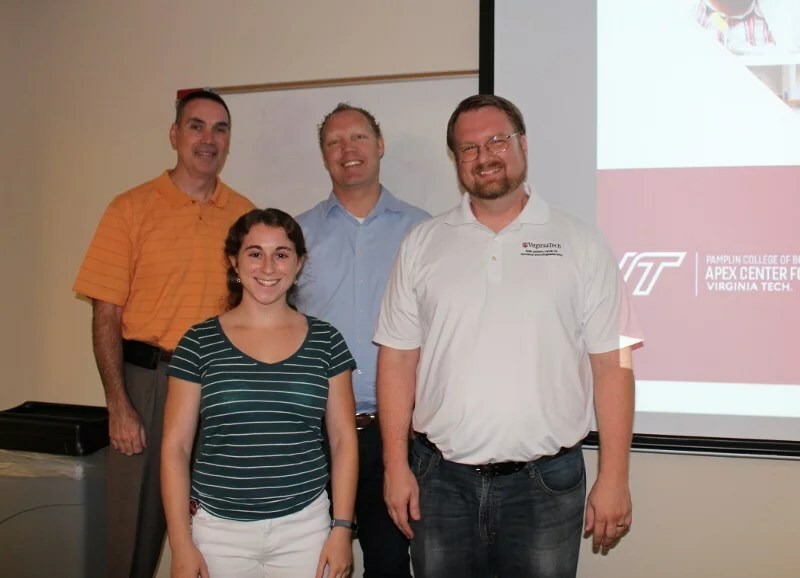 of Biomedical Engineering and Mechanics in the College of Engineering, Derek Maggard, and Howard Haines, Associate Director of Virginia Tech’s Innovate Living-Learning Community. The Virginia Tech Carilion Biomedical Research Expansion, under way across the street from the Virginia Tech Carilion Research Institute where the TBMH classes are held, is creating excitement even while the structure is in the earliest stages of construction. “Carilion is becoming the crown jewel of downtown Roanoke. The new building the community is seeing going up will house additional labs,” said Maggard. Keith Baugh was a molecular biology undergrad at Fort Lewis College in Durango, Colorado and is excited about pursuing his PhD through Virginia Tech’s TBMH program. “This training is to make sure you’re speaking the right language to get investments and get through regulations so the research can reach people and help people. This program trains students on how to develop the science, get a patent and take a product to market. 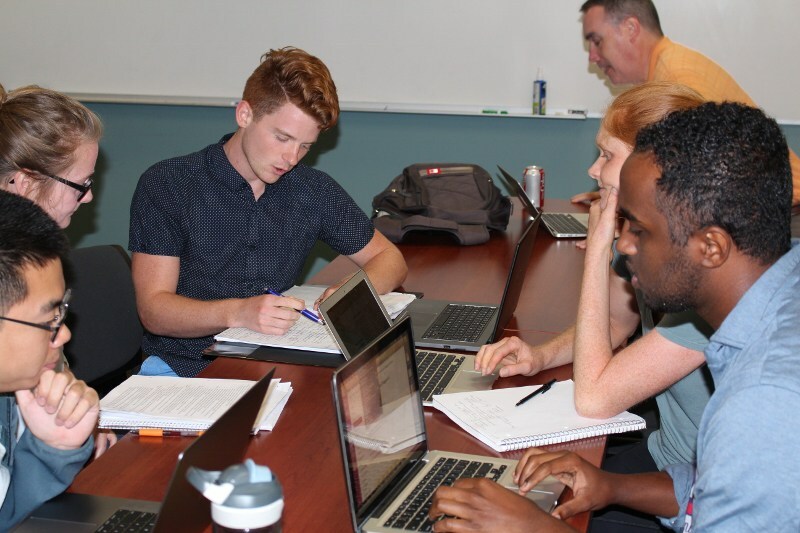 A bonus of the program is that medical students take classes with business students and engineering students, giving them a unique opportunity to form valuable connections beyond their traditional academic program,” said Baugh. The ‘end game’ thinking that is foundational in planning an entrepreneurial approach to science is key. “This is a way to help bring what we are doing in the lab and allow it to impact the actual population. By introducing researchers to the idea of bringing products from the lab to market completes the circle—bringing taxpayer dollars back to the taxpayers,” said Bochicchio. See this post as it originally appeared on The Roanoke Star.